Sister Frances Will, O.S.F. (formerly Sister Emily Leo), 90, died June 20 at Assisi House in Aston. 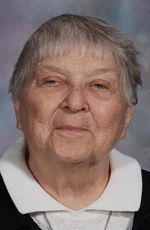 She had been a professed member of the Sisters of St. Francis of Philadelphia for 66 years. She entered the congregation in 1946 and professed her first vows in 1949. Sister Frances served in education ministry for 36 years in the Archdiocese of Philadelphia and for 28 years in the Archdiocese of Boston, and she was an accomplished musician. Her funeral Mass was celebrated June 26 at Assisi House. Sister Frances is survived by her nieces and nephews and by her Franciscan family.